The version of Snow Leopard you buy today is 10.6.3, and will need updating to the latest version, 10.6.7 at the time of writing. 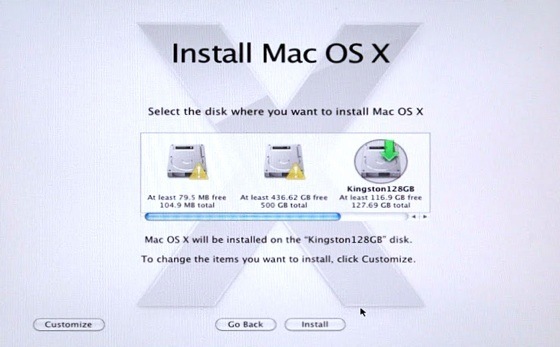 The recommended way of doing this is to download the official Apple 10.6.7 Combo package. 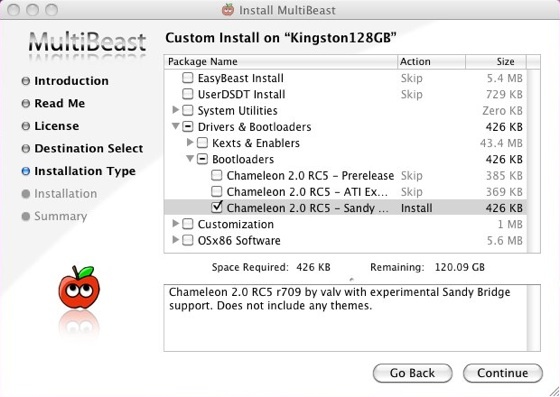 Hackintoshers may also download the tonymacx86 "Multibeast" package. Install the Combo package first. It'll invite you to reboot, but before you do that, run Multibeast. It gives you a number of options, so you'll need to check your system and read the documentation to pick the right ones. I needed to enable USB and Ethernet. Now when you reboot you should be able to do this directly off your hard drive, putting the iBoot disk aside. The Ethernet gave me an Internet connection, and to test the USB I plugged in a Logitech C910 Webcam - its essential camera and microphone features worked right out of the box, requiring no tweaking or kext fiddling. The only thing still not functioning is the HD Audio built into the Sandy Bridge motherboard. Future official Mac updates will take care of this. Meanwhile, I've settled for simply plugging in an external USB sound system. I'm using the M-Audio Fast Track box from Avid, but any digital-to-analogue USB sound adapter - 99p on eBay, including postage and packing - should do the job. One piece of kit that arrived late in the day was the Freecom eSATA Hard Drive Dock. It plugs into the eSATA (external SATA) socket on the motherboard back-plate and allows me drop in 3.5 inch or 2.5 inch SATA drives. I should have had this with me right from the beginning - juggling multiple potential boot drives outside the machine is extraordinarily useful when you're experimenting with operating system installation, giving me a chance to explore Snow Leopard installations in way that just wouldn't be possible with internal drives. Next page: But is it Legal?